Situated between Guatiza and Mala is an unusual sightseeing attraction that combines art with nature. Artist Cesar Manrique created a work of art in the form of a cactus plantation in an old quarry. 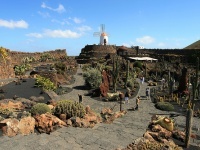 The Cactus Garden was Manrique's final piece of work in Lanzarote. More than 7,000 cactuses from well over 1,000 different species from all over the world are represented in the garden, with many coming from Madagascar, Mexico, Chile, Morocco, the US and the Canary Islands. The plants come in all shapes and sizes and have been arranged beautifully in a landscaped garden with many water features. The site also features a restored windmill, which visitors can climb. It is a weird and wonderful collection which makes you feel like you're on another planet, and most people need at least two to three hours to explore. The old quarry is a sun trap and gets really hot, so it is best not to visit on a sweltering day, or at least to avoid the hottest time of day. There is a cafe at the site which sells light meals and provides welcome shade and lovely views over the garden. The Cactus Garden is an unexpected and unusual attraction which receives rave reviews from visitors and should amuse people of all ages. Opening times: Daily from 10am to 6pm. Admission: €5 (adults); €2.50 (children aged 7 - 12).